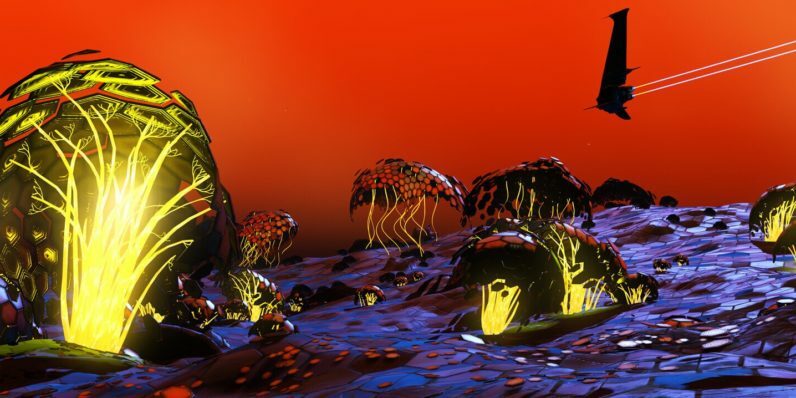 The latest update for No Man’s Sky was unveiled today, and the much-maligned game is finally taking the form it was supposed to have on release. The introduction of multiplayer is especially encouraging. In case you missed (or have blissfully forgotten) the circus of unfulfilled expectations that swirled around the release of NMS, one of the most cutting was the lack of any multiplayer whatsoever. The developers never outright stated that there would be no multiplayer — in fact, they coquettishly skirted the issue. But two players managed to land on the exact same planet and meet on the same spot and couldn’t see each other. Now that is apparently being rectified, if only in a simplified form. Players will be able to explore with up to 16 other players — all of whom will look like glowing orbs. Baby steps, I guess. This time last year, I’d have told you that it’d take a miracle for me to consider playing it again. The “Foundation” update did a little to endear the game to me, but this might just convince me to give this previously-underwhelming title another pass — provided it manages to look as good as it sounds.